Etching was invented in the 15th century by a German, Daniel Hopfer. 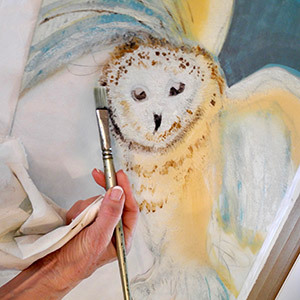 The process used to create and print etchings has changed very little over the centuries. Some materials have been adapted to make the process less toxic for the environment and artists. To create an etching, the artist’s design is cut into a protective coating on a metal plate, (copper or zinc), using sharp etching needles, and then placed into acid to cut deeper lines into the metal plate. Ink is then applied onto the metal plate and into the cut lines. The surface areas are carefully wiped clean to provide white areas. Using a high-pressure etching press the plate is pressed onto a sheet of dampened paper and the inked image in the deep lines, is transferred into the paper. 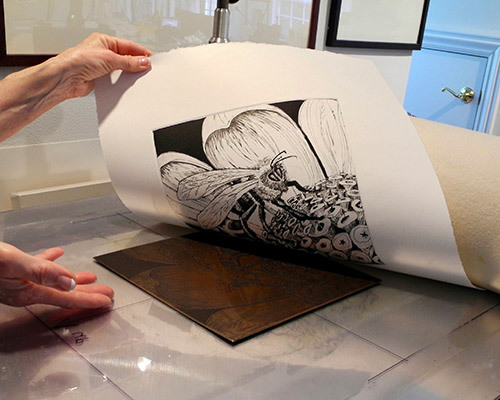 Etchings are inked and produced by hand, one at a time. The artist determines a limited number of prints, an edition, to be printed from an etching plate, which is indicated by a fractional number written on each of the prints. A small number of other prints which were trial proofs, stages of development, and the artist’s final proof may also exist. These other prints are labeled as such. The metal plates are struck, a line cut through them, or destroyed after an edition is complete. 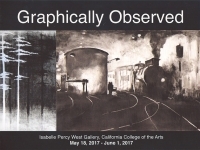 All prints that are printed from the ink in the recessed cut lines of a plate are generically referred to as “intaglio” prints. A process imitating the broad flat tints of wash drawings by etching a microscopic crackle or dot pattern on the plate intended for printing. An aquatint appears as varying shades from light to dark. These two definitions are often confused. A monotype is any image that is applied to a flat surface, often spontaneous and painterly. A sheet of paper is pressed against the flat surface and the image is transferred to the paper. It is the only print made from that plate and is one of a kind. If a print is made from a plate which contains some reproducible element, such as a carved line or an etched design, it is then called a monoprint. It may still be very loose or painterly in style, but the inclusion of a reproducible image within the print places the print in the monoprint category. Monoprints often include collaged elements as well. While there are elements within a monoprint that are able to be repeated, the monoprint is still a one of a kind print. Linoleum was invented in Germany in 1860 as floor covering. In the early 1900s linoleum was used to print wallpaper designs for victorian homes. Linoleum was used by artists from Pablo Picasso to Henri Matisse, and is today considered a respectable printmaking art form. Linocuts are a form of “relief” printing. Relief printing refers to any print which is printed from the raised portion of a carved, etched or cast block. Woodcuts are among the earliest forms of relief printing. 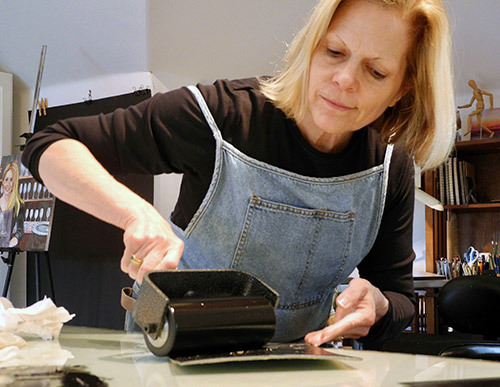 A linocut is made by using sharp curved blades to scoop out material from sheets of linoleum. The material removed will be the white part of the final print. The surface of the linoleum sheet is rolled with ink and then using pressure, either by hand or with a high-pressure etching press, the design is transferred onto paper. Each print is hand inked and pressed one at a time. The artist determines a number of identical prints, an edition, to be made from the linoleum plate. The number of the prints in the edition are indicated with a fractional number written on each of the prints. There may be other trial proofs, developmental stages, and a small number of artist’s proofs, all of which should be labeled as such. Once the edition is complete the plate is struck with a line through it, or destroyed. Keeping a daily sketchbook provides inspiration.